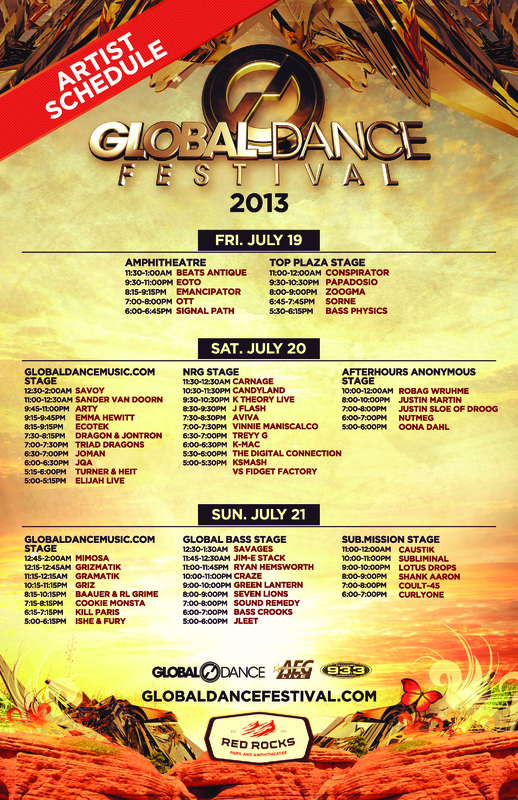 Global Dance Festival is coming back to Red Rocks Amphitheatre in Colorado for three days this weekend. Usually this fest is the Denver rave scene’s hottest summer event. But this year, they’re switching up their game plan a bit. Not to worry though, all of you bass heads and ravers will still get your fix. Friday’s artists make this year’s GDF stand apart from other years. Beats Antique will be joined by EOTO, Emancipator, Conspirator, Papadosio and others catering to a more “hippy” crowd that you’d normally associate with festivals like Sonic Bloom in Georgetown, CO. Saturday is going to be the day where all the ravers, kandi kids and electro heads rejoice in the usual GDF house bangin’, club stompin’, dance music. Top billed artists on Saturday include Savoy, Sander van Doorn, Arty and other usual Triad favorites. Dubstep and dirty bass fiends alike will have Sunday to look forward to with a special performance by Grizmatik (Griz and Gramatik **NOT TO MISS**) as well as sets by Mimosa, Cookie Monsta, Kill Paris, and fresh off his viral sensation “Harlem Shake”, Baauer, who will be joined by R.L. Grime. Tickets are still available and can be purchase here.